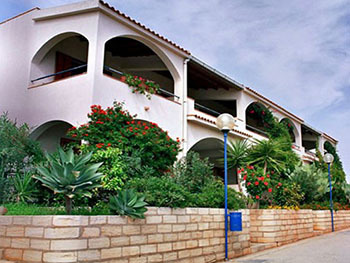 Our flats, divided into two different structures, ideal for a very relaxing stay, are planned to satisfy all our guests and to render their holiday more pleasant. 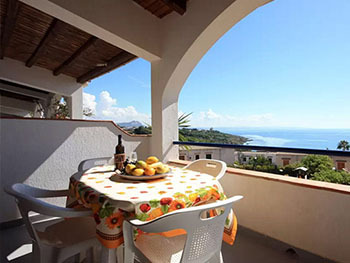 The flats are suitable both for those who want to spend a holiday with their family and children, for those who desire a romantic holiday and for those who need to have a business stay. 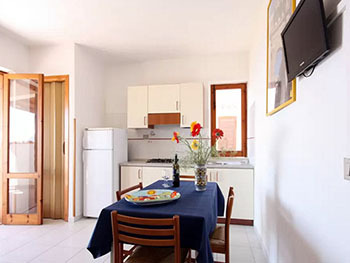 We have at our disposal 25 flats furnished in a functional and comfortable way, everyone with an independent entrance, kitchen with accessories as dishes, fridge and freezer. Every flat has a bathroom with a shower and a wide veranda/balcony where one can relax. Every flat has a private inner parking. Our structure offers three different kind of rooms for a beautiful holiday. Our three solutions guarantee the maximum satisfaction for your stay. 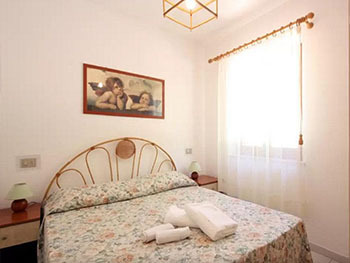 Studio flat: 3 bed accommodations – with a wide living/dining room, kitchen area and a double bed, bedroom with a single bed, bathroom with shower and balcony. Lateral sea view. 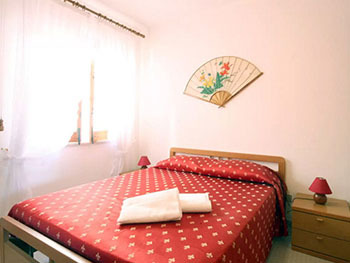 Two-room flat B: 4 sleeping accommodations - Dining room with kitchenette, double or double sofa bed, double bedroom, bathroom with shower, veranda. Three-room flat – B Type: :6 bed accommodations – Living/dining room with kitchen area, double bedroom, sofa bed, bedroom with a bunk bed, utility room, bathroom with shower, covered veranda and private shower outside. First or raised ground floor. Sea view. Triple tipe B:6 beds - living room with kitchen, sofabed,closet, kingsize room, bathroom with shower, castle beds room, cover veranda. First floor, sea view.